One of Philadelphia’s own representatives of heavy metal, CORNERS OF SANCTUARY, are getting in the Christmas spirit with a new recorded gift for music fans. 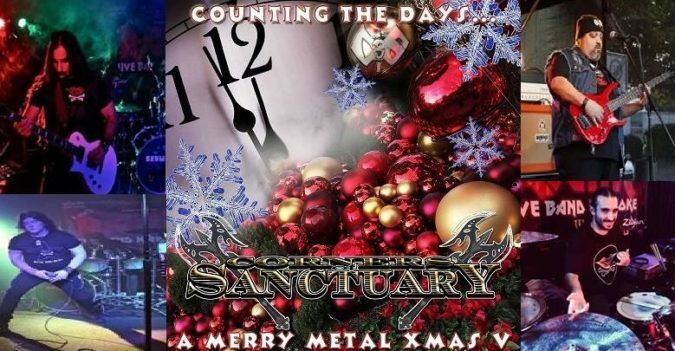 The fifth installment of CORNERS OF SANCTUARY‘s annual metallic merriment arrives via the recently released, six-song ‘Counting The Days… A Merry Metal Xmas V‘ EP. It is out now from Exquisite Noise Records USA, available digitally at all major online outlets, while a limited run of CDs are also available exclusively at the official COS website HERE. The title track of the EP, “Counting The Days ‘Til Christmas Comes”, is available as a lyric video and is streaming below. The EP also contains the non-holiday track, “Meet Your Maker”, a song that originally appeared on the band’s 2015 album, ‘Axe To Grind‘. The newly re-recorded bonus track is available as a holiday gift MP3 download at this LINK.